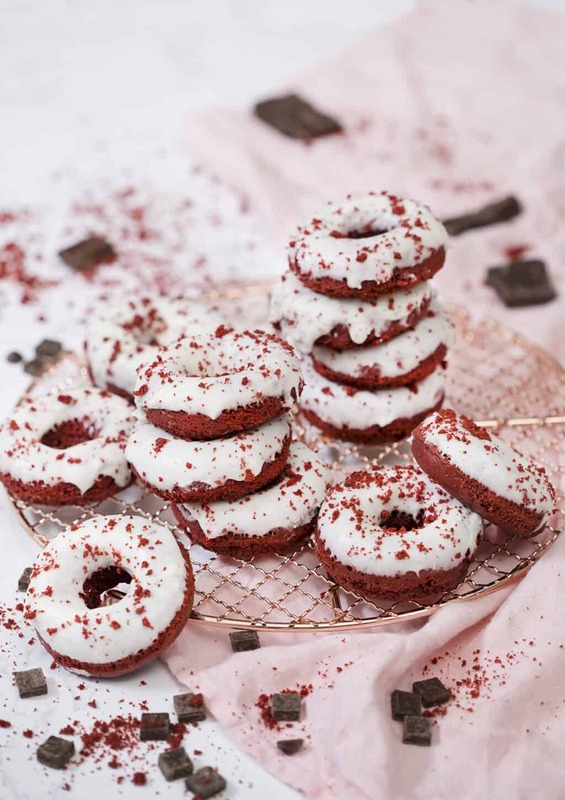 These moist red velvet donuts topped with an amazing cream cheese frosting are too delicious to resist. Who knew chocolate and cream cheese would be such a winning combination? I guess everyone since red velvet is super-popular! 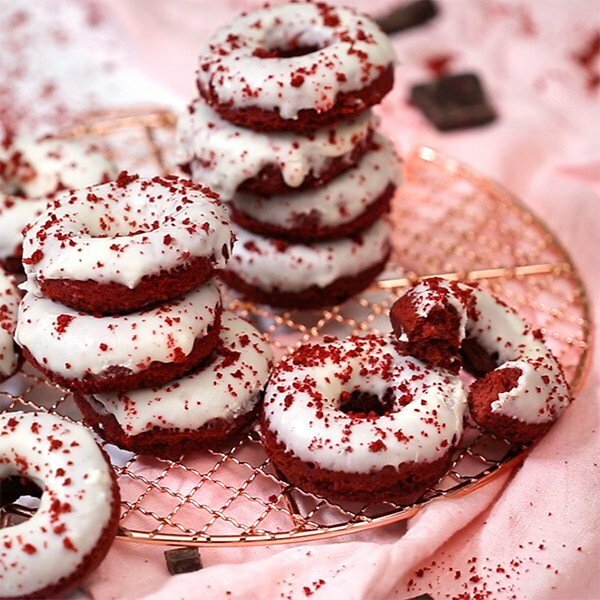 These donuts have just the right note of chocolate to complement the cream cheese frosting and they are SO MOIST!!! That’s the nice thing about baked donuts, besides not needing to heat up all that oil they really absorb the moisture from the glaze and become melt in your mouth tender. Baked donuts are different from fried ones. Instead of becoming stale over time they start to fall apart as the glaze soaks in, so better eat them quick! If you want to make them ahead of time just don’t glaze them until you’re about ready to serve. I think these donuts are good for any time of year but they do have a bit of valentines day spirit! If you don’t use any food coloring they end up a dusty brownish pink with is beautiful in its own way but not in a way that photographs well… I had a bit of extra batter so I made a couple cupcakes and sacrificed one to crumble to a bit of contrast on top. You can play around with the thickness of your glaze by adding milk slowly until you’re pleased with the consistency. It will vary slightly based on how you pack your sugar, ambient humidity etc. This glaze is amazing on nearly everything so try it on your next bundt or pound cake. Preheat to 350 degrees F. Butter a donut pan. Whisk the dry ingredients. In another bowl, whisk together the buttermilk, melted butter, vanilla, and egg. Fold the wet mixture into the dry mixture. Add drops of red food coloring and mix until you reach a desired color. Transfer batter to a piping bag. Snip off the tip. Bake for 10 minutes. Test with a toothpick. Let the donuts cool on a wire rack. In a stand mixer fitted with a paddle attachment, beat together cream cheese and vanilla until smooth. Add in sifted confectioners sugar and milk. Add milk until you reach a desired consistency. Beat for about 5 minutes. Dip donuts into frosting. 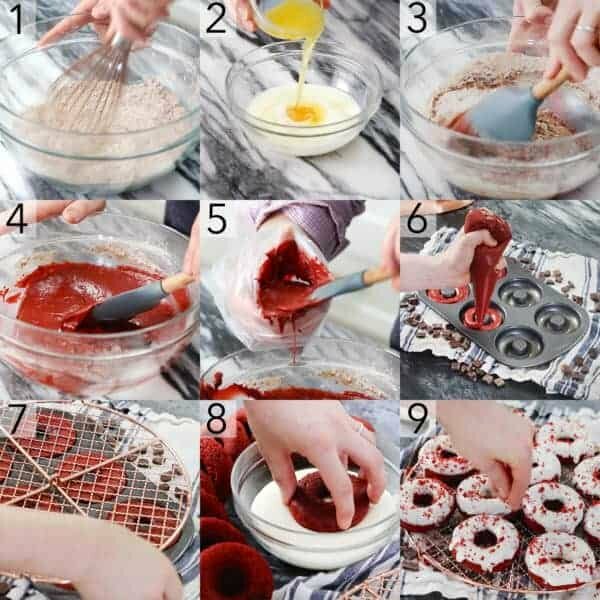 Sprinkle leftover crumbs onto glaze. 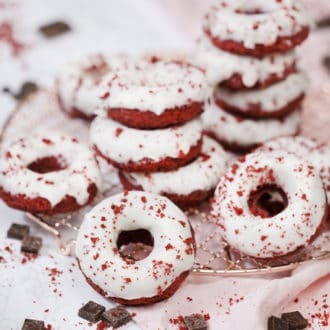 If you’ve tried these donuts then don’t forget to rate the recipe and let me know how you got on in the comments below, I love hearing from you! The most moist donuts with a perfect note of chocolate to complement the cream cheese glaze. In another bowl, whisk together the buttermilk, melted butter, vanilla, and egg. Fold the wet mixture into the dry mixture. In a stand mixer fitted with a paddle attachment, beat together cream cheese and vanilla until smooth. Add in sifted confectioners sugar and milk. Add milk until you reach a desired consistency. Beat for about 5 minutes. If you don't use any food coloring they end up a dusty brownish pink with is beautiful in its own way but not in a way that photographs well... I had a bit of extra batter so I made a couple cupcakes and sacrificed one to crumble to a bit of contrast on top. You can play around with the thickness of your glaze by adding milk slowly until you're pleased with the consistency. It will vary slightly based on how you pack your sugar, ambient humidity etc. This glaze is amazing on basically everything so try it on your next bundt or pound cake. This looks so yummy! Could you use the recipe for a cake? If so, what would you suggest the cooking time and temp be for a 8” round cake? Yes, this recipe can definitely be used for a cake! Bake at 350 degrees F for about 20-25 min or until the centers are springy! Hope that helps! If I wanted to make these as mini donuts, do I need to adjust the time/temp? Would love to make a smaller version for my kids – my daughter would go nuts! Bake minis at 325 degrees F for about 8-10 minutes! Hi John, i would love to try some of your receipes, would you mind adding grams to your receipes? As I live in Australia and the cup to grams converter here is different than to US so it’s a bit confusing. Thanks heaps! I’ve added in a few measurements, but I don’t have the rest of the ingredients in grams! Next time I make donuts, I will definitely update to grams! Hola John!! Saludos desde Argentina!!! Estoy enamorada de tus recetas!!!! Muchas gracias por compartirlas!!! Mí consulta es: el suero de leche, es lo que en otros países es crema de leche o nata??? Y el azúcar confitada, es azúcar glas o azúcar impalpable??? Muchísimas gracias!!! Ya deseo hornear tus delicias!!! Saludos!!!! El suero de leche no es como la crema. La crema es mas rica. El azúcar glas es azucar de polvo. Puede substituir un poco de crema con leche, o usar el suero de leche donde llame la receta. Hope you enjoy! You can yes! Try the flax seed substitute. Overnight in an airtight container is fine but frost before serving. Tu, fiesta of all, thank you for sharing your receipes! Plasencia clarificó un the listo of ingredientes you mention 1 trasponiendo esperado powder, it’s coffee, right? Yes! Like a powdered coffee. Where did you get the donut pan?